I'm a sucker for novels in scriptural settings, especially those that strive to shed light on the lives of women in Biblical times. I admire the imagination, study and effort it takes to fill in the gaps in the scriptural text to make these too foreign stories make sense to our modern minds. 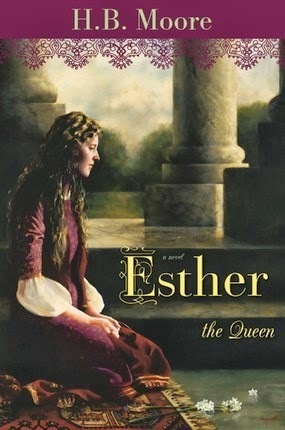 In Esther the Queen, a Whitney Award finalist, Heather B. Moore does a solid job of making Esther come to life as a realistic, sympathetic character. King Ahasuerus is given depth as well, as Moore allows him to express his regret for the decisions that he made leading to Queen Vashti's banishment, accepting his own responsibility for the situation and willing to look at how he can improve. The tensions between the dominant Persian culture and the Jewish minority are well explored and explained. The elements Moore adds to the story to help us modern readers connect the dots may or may not be how it "really happened," but they move the story forward in a plausible way. She provides Haman believable impetus for hating the Jews as virulently as he did in the Biblical text. I really like how she orchestrates the first accidental meeting between Esther and Ahasuerus, too, that sets everything in motion. Mordecai could have been fleshed out a little better, I thought, though I enjoyed the introduction of his children at the beginning. I greatly appreciated that while Moore emphasized the positive influence Esther was on her husband, King Ahasuerus, their relationship was marked by mutual respect for each other and, particularly at the end, each other's religious beliefs. Since the rebellions had died down, they'd slowly focused on making some adjustments in the palace. The cooks prepared food that was acceptable according to the law of Moses for those Jews who served in the palace. The Jews weren't penalized for leaving their stations early on the Sabbath eve. And Jewish religious celebrations were accommodated. And there had been allowances on Esther's part as well. She agreed that their children would be taught both religions, and they would be allowed to choose as they reached adulthood. Esther had come to respect the beliefs of her husband and his deep spirituality, which didn't include the Lord she believed in. While perhaps a bit biased toward a more modern representation of Esther and her story than would have been reality, I thoroughly enjoyed Moore's take on the tale behind Purim.